Rugged cable assemblies, suitable for rail, transportation and heavy industrial applications, are available from TE Connectivity. The M12 cable assemblies conform to EN45545 HL3 with fire and smoke characteristics. TE’s M12 cable assemblies are suitable for public transportation and other heavy industrial applications, says the company. The rugged design enables them to withstand the vibrations experienced in trains and other demanding environments. The M12 cable assemblies meet the demand for increasing digitisation in applications such as rail data communication systems, said Egbert Stellinga, product manager at TE Connectivity. They deliver up to 10Gbit per second and are robust, he added. 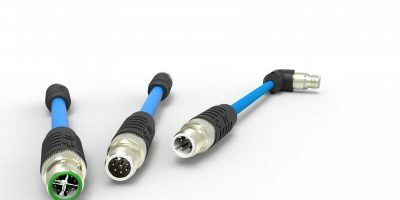 TE’s series of standard M12-to-M12 cable assemblies uses compact, straight and right-angled connectors, allowing the cable to be used in confined areas. The full metal shell in combination with secure cable shield termination makes the system EN50155-compliant. Together with fire and smoke compliance, the cable can withstand severe shocks and vibrations according to EN 61373 Cat1 Class B due to its rugged design and machined contacts, says the company. The crimped cable strain relief contributes to the high data speed and also eliminates conductor breakage that could lead to system failure. The crimping system creates a tamper-proof installation, preventing accidental unlocking of the strain relief. High speed category 5e or 7 cable ensures the M12 cable assemblies meet future requirements, for network upgrades. M12 cable assemblies are IP67-sealed and tested in TE’s factory to eliminate the possibility of false wiring. They are available in lengths from 1.0 to 20m in 0.5m increments. Special lengths can be handled on request. They come pre-assembled, reducing installation time and enabling quick implementation of data networks. TE Connectivity has been manufacturing connectivity and sensor products for over 75 years. The company’s products are proven in the harshest environments, transportation, industrial applications, medical technology, energy, data communications, and the home. TE Connectivity has 78,000 employees, including more than 7,000 engineers, and operates in nearly 150 countries.